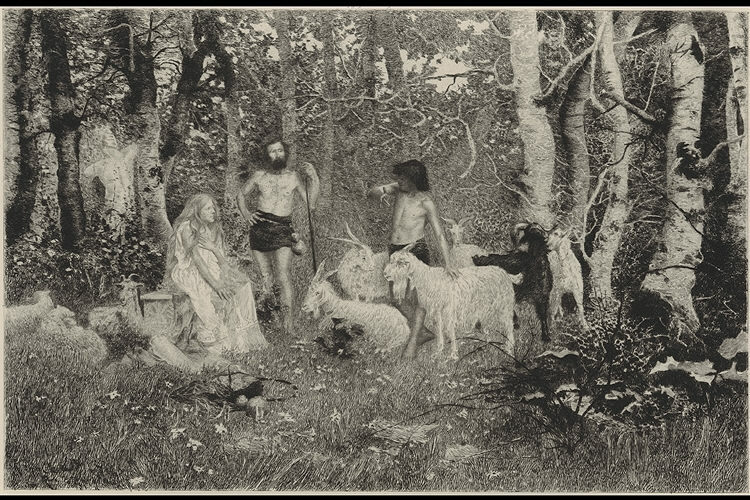 "This Spanish painter has chosen for the personages with which to animate his well painted woodland scene the characters in the pretty Greek pastoral, told by Longos, a Byzantine, in the fourth century of our era, - the shepherd and the shepherdess yet too young to know that they are lovers, their spotted and horned flock and the bearded stranger who visits them one day. Daphnis is telling the story of his mysterious youth, the young girl listens in suspense, her hand on her heart, and something of the old unworldly, antique charm that settles down over the mimic scene. The artist, who is of Seville, received a medal of the third class, at the Exposicion Internacional de Bellas Artes at Madrid, in 1892, and is represented by four pictures at Chicago, of which this reproduced by the etching betrays the most individuality."